Denali National Park - Blog from Denali, Alaska | Dreaming of a White Christmas! We walked to the main lodge for breakfast with snow gently falling on us. There wasn't enough to settle on the ground but our coats were covered. Today was the last day the park was open. Everything closes up tomorrow and Saturday until 1st May next year. Even the traffic light gets turned off. As it was the last day, there was only one tour into the park. You are not allowed to drive private cars past mile 15. In the summer, there are shuttles you can catch around the park getting on and off as you please. Our tour today took us to mile 30 and up to 3000 ft. Once we started to climb, we entered the winter wonderland. The trees and ground were covered in snow and some of the mountains were completely covered. It was absolutely stunning. Photos don't do it justice. The fog even started to lift and we had a glimpse of sun. The tour was 6hrs and we had 3 stops. The first stop was Mountain Vista Trail. It was an easy walk around a loop trail. Our guide & driver, Tom, told us it was quite possible we would see a moose here. And we did!!!!! We had only been walking about 10mins and Robyn saw it near some trees. We started to walk closer to it while staying on the trail and the nut started walking towards us. That was suddenly a bit freaky as Tom hadn't given us any moose safety instructions. But, he just crossed the trail and continued on his way through the trees and bushes. 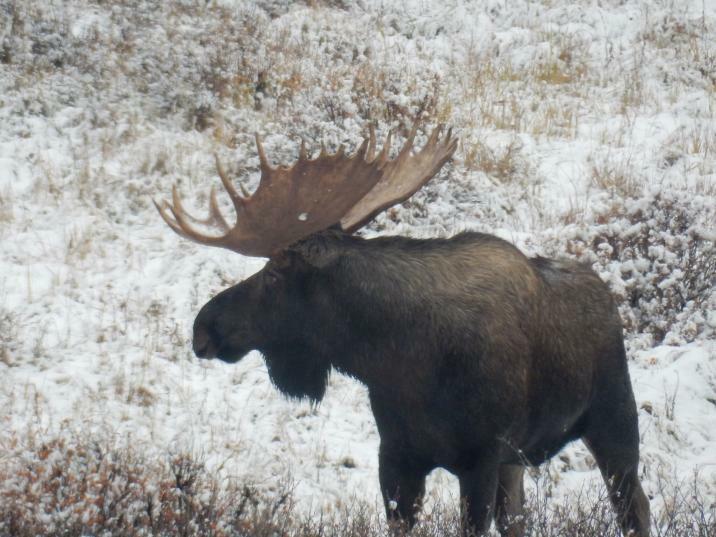 It was very cool to see a moose! We had an hour at this stop to walk around the trails and take photos. We got back on the bus and continued further into the park. As we approached a river crossing, we saw lots of cars stopped on the side of the road. There was another moose there. It was another male & he seemed quite agitated. He was rubbing his antlers on the bushes and then turned and ran straight across the road. Every year there is a road lottery where Alaskans can apply for a permit to drive their own car into the park. It happens on the last 4 days of the season. Not everyone who applies will get the permit. It is very restricted to ensure the park remains a true wilderness area. After the visitors centre at mile 15, there is practically nothing man made in the park. There are a few toilets but no running water and some look out areas. That is it. At our second stop, we walked out on a boardwalk to a viewing platform. There was a river below which was running in channels but the riverbed itself was much wider and mostly dry. There was a forest of spruce trees beyond that & playing at the edge was a mother bear with 2 cubs. Very cool. We certainly weren't as close as we were at Brooks Lodge but it was still cool to see them. As we climbed the mountain, the trees stopped and it became a tundra. The winters are just too harsh for trees to survive. The first tour of next season will enter the park on 20th May. They spend the time from the 1st clearing the roads of snow. There is only one road in the park so once we got to mile 30, we turned around and came back the same way. This time we stopped at the visitors centre to watch a short film about the park and look at the displays. At the end of the tour, Tom gave each person a small book about the park full of photos. It is a really nice souvenir. We have an early start tomorrow. It is a 5hr drive to Anchorage and we have to have the car back by 11.30am. Wish us luck as we don't have a GPS!! !